This tool separates the skin or rind of avocados, kiwis, papayas, baked potatoes, squash, and melons with ease. Dimensions: 7" x 3" x 1.5"
Cleaner, healthier eating is easier with Peel Ripe Loops. This versatile tool solves prep and peeling problems for avocados, mangos, peppers, kiwis, melons and more. 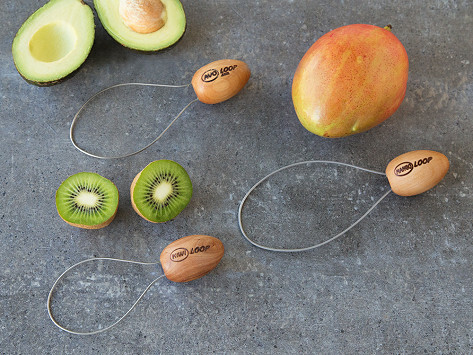 Created by Kevin Kimsey, a former graphic design artist, the Peel Ripe Loops tool lets you easily separate the edible parts of fruit and veggies from the skin. Healthy eaters of all ages can use it thanks to its tempered stainless steel wire—there are no sharp edges—and ergonomically shaped handle. Another benefit: less food waste. Peel Ripe Loops cleanly carves out as much of the good stuff as possible, giving you maximum enjoyment of your fresh food.